Clear Resin for creating and embedding decorative objects. Our Polyester Clear Casting Resin is an excellent resin for casting objects, costume jewellery, paperweights and casting table tops for occasional use. Once cured, this resin will require sanding and compounding. 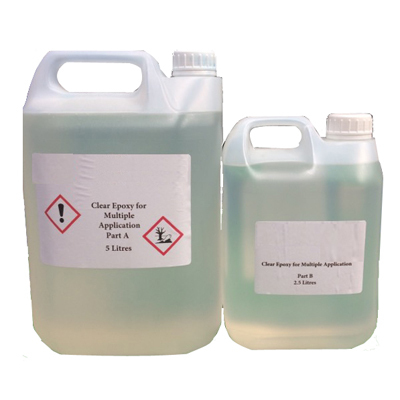 The Epoxy Clear Cast is an advanced, hard wearing resin suitable for resin river tables, penny floors and bar tops. Once cured this resin will cure tack free and will not normally require any sanding or compounding after curing. To calculate the volume of resin required multiply height (in metres) x width (in metres) x depth (in millimetres). e.g. Require coverage for a table - 1 metre high x 2 metres wide x 5mm depth = 10 litres/kg of resin.